Fined 5s on Monday 5th January 1863 for having house open at illegal hours on the previous day. Convicted 31.08.1934 for selling in other than an Imperial marked measure. Fine £1 plus 7/6d costs or 14 days detention. c1910 : A group of workers from the Singer Factory in Coventry. Offered For Sale by Auction, Wednesday 24th June 1868 along with Two Cottages and Cellars to the rear. ; also a capital Shop and Dwelling-house situated on Church Plain. The public house being described as Newly Erected and located opposite Messrs. Lacon's Beer Stores. 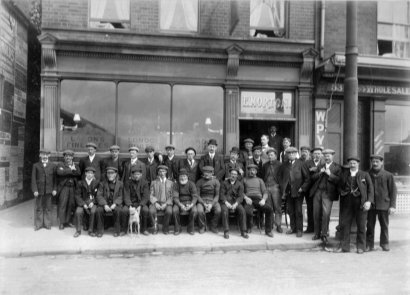 On Friday 13th January 1905 the licence was transferred and it was stated that the rent was £30 per year.